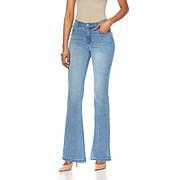 A boot-cut jean looks good on every body type. 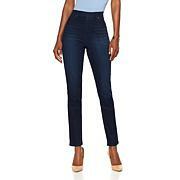 The slightly flared silhouette balances the hips and thighs and visually lengthens your legs. Double the impact with a high heel or boot. Bought three of these jeans and two were longer than the other one. Sent 2 back. Wish sizing could be more precise. got these in petite 14 gray and I love them. I am in a gray mood and these look terrific on me and fit me perfectly. I would buy more but my HSN card is maxed. Triple love them, bought the gray jeans. I ordered one size down, perfect fit. Comfortable and beautiful, thank you, Diane. The jean fits very well. Good looking on your body. Very comfortable.